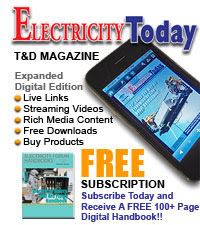 - Signal transfer quality is good. - Modal noise is absent.
. Dispersion of single mode silica fiber is lowest at 1300 nm while its attenuation is minimum at 1550 nm. For achieving maximum transmission distance the dispersion null should beat the wavelength of minimum attenuation. 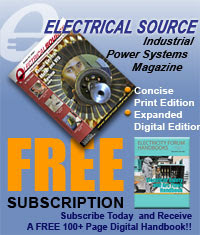 The waveguide dispersion is easier to control than the material dispersion. Therefore a variety of core-cladding refractive index configuration fibers. Such as 1300 nm optimized fibers, dispersion shifted fibers, dispersion – flattered fibers and large effective core area fibers.
. Matched cladding fibers have uniform refractive index throughout its cladding. 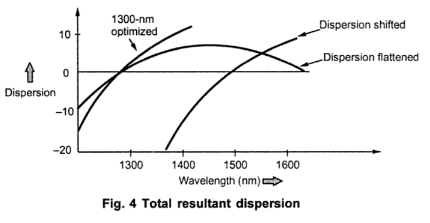 Typical diameter is 9.0 µm and Δ = 0.35 %.
. Dressed cladding fibers have the innermost cladding portion has low refractive index than outercladding region. Typical diameter is 8.4 μm and Δ1 = 0.25 %, Δ2 = 0.12 %. Fig. 1 shows both types of fibers. 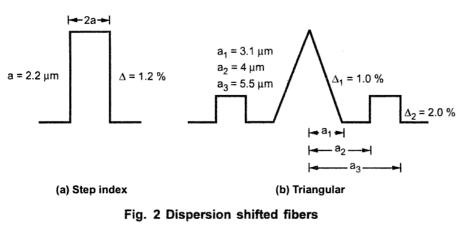 a) Step index dispersion shifted fiber. b) Traingular dispersion shifted fiber. Fig. 4 shows total resultant dispersion. Where, Ԏ is group delay per unit length of fiber. Where, σλ is half power spectral width of source.
. As the dispersion varies with wavelength and fiber type. Different formulae are used to calculate dispersions for variety of fiber at different wavelength. λ0 is zero dispersion wavelength. S0 is value at dispersion slope at .
. Fig. 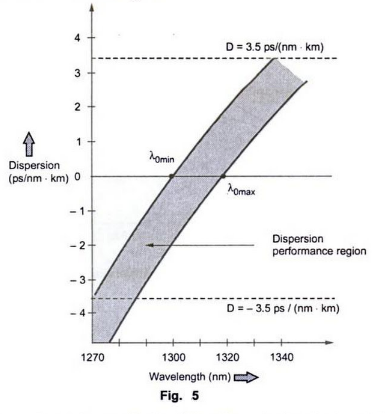 5 shows dispersion performance curve for non-dispersion shifted fibers in 1270 – 1340 nm region.
. Maximum dispersion specified as 3.5 ps/(nm . km) marked as dotted line in Fig. 5.
. The cut-off frequency of an optical fiber is determined not only by the fiber itself (modal dispersion in case of multimode fibers and waveguide dispersion in case of single mode fibers) but also by the amount of material dispersion caused by the spectral width of transmitter.
. The macrobending and microbending losses are significant in single mode fibers at 1550 nm region, the lower cut-off wavelengths affects more. Fig. 6 shows macrobending losses.
. 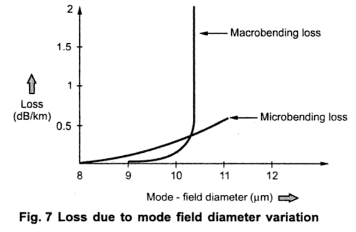 The bending losses are function of mode-field diameter, smaller the mode-field diameter, the smaller the bending loss. Fig. 7 shows loss due to mode-field diameter.
. The bending losses are also function of bend-radius of curvature. If the bend radius is less, the losses are more and when the radius is more, the bending losses are less.